When using older machines, you form an opinion on how they perform. (And judging from this post over at The Typewriter Revolution, opinions are indeed formed :-) All types indeed must have their strengths, weaknesses and idiosyncrasies. With older machines however, how that one specimen performs is only partly due to its construction and design. To probably a much larger part it is the consequence of the way the design and the specific machine has aged, the use and abuse it got and the various storage conditions. It is the one machine showing how the design can perform on one aspect, that then triggers the search for improvements to make sure the other also reaches that level of performance. For example the linefeed; on the black machine this was a bit stiff - on the red machine light. 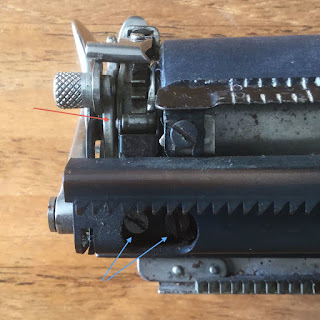 Without the red machine, would probably have put the linefeed with the short lever down to a design property - Remington Portable #2 machines have a bit a too short linefeed lever for comfort. The red machine working like a charm however prompted a closer look at the linefeed mechanism of the black machine. Took a while for the penny to drop, but then realized that the small roller that holds the ratchet on a line position was not rolling on this machine. It was dragging over the ratchet, pressed down into the position by the spring against the friction over the teeth. After a very small drop of oil and some nudging of that little roller, it started to roll freely again. So no longer does the linefeed lever have to drag (friction) the roller over the ratchet, but it rolls over the teeth with only the spring force needing to be overcome. 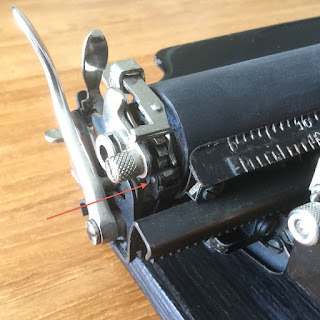 This also makes the linefeed more reliable and regular, as the spring no longer has to overcome friction in pressing the roller down into the line position. Unlikely to need this, but for tweaking a bit further the risk can be taken to loosen the (left) mounting screw of the spring holding the roller a little. When keeping enough tension on the spring the screws still stay firm, otherwise a small washer or shim behind the spring can be good to use. The difference made by the simple making-free of the roller was surprising. Now also the black machine is very easy to work with, the carriage return and the linefeed can easily be operated with a finger (the pinkie even, if so desired :). Without the example of how it could perform, would probably not have found this simple issue. Now wondering; what little issues are hiding in other, singleton machines? Very good point. Yes, it's often so useful to compare two "identical" machines, which are never really identical. Having a second comparison typewriter while doing repairs is so appealing to me. I am thinking about getting a second Oliver or second Corona Sterling in broken condition as I currently have a functional Oliver and functional Sterling I could use for reference while I make repairs. I've always thought that no two older machines will work alike, and I personally cherish these little peculiarities, because they tell me not only of the weaknesses of the design, but of the other persons who used the machine before me. I think that, if there's a degree of immortality we as humans can aspire to, is the permanency of our works. The things we used and made will be the witnesses of our existence long after we're left this world, and they will be a way in which we can get in touch with newer generations. ... Alas, that is less and less the case with the increasingly digital world we live in. Now our chances of immortality depend on something as intangible and vulnerable as the Internet. Sure,our blogs will remain, but it's not like they will be tangible (or even accesible) to people living 10 or 20 years from now, let alone in a hundred years. 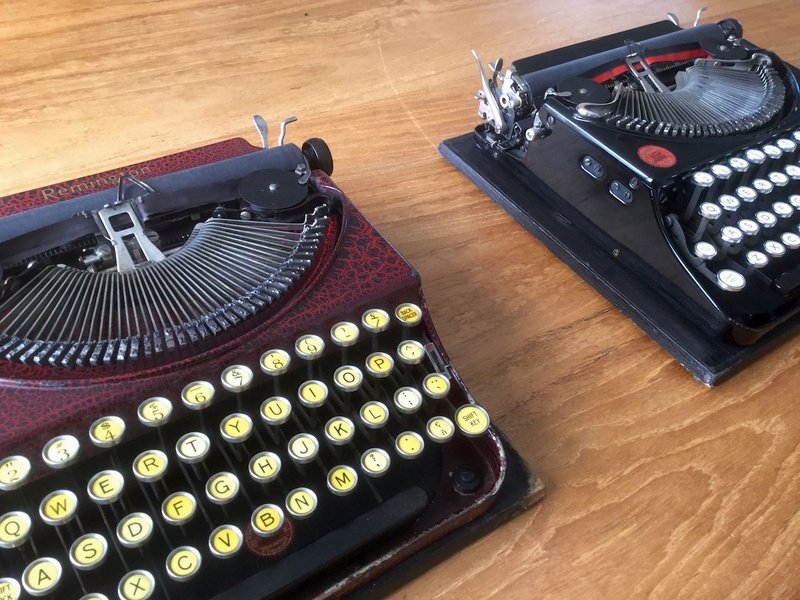 In that sense, we're doomed to have a lot less "immortality" than our foreberars, the people who used (and abused) the typewriters in our collections.